This blog was created for people who are big foodies like myself. Foodies who enjoy eating out and trying different restaurants sometimes need recommendations on where to eat and what to order. Want to impress your boss, or someone special on that first date? How about a night out with friends or family? That's where I come in. :) I hope anyone who stumbles upon this blog will find the contents useful and worthwhile. This cozy little restaurant in Sunnyside sure lives up to its name. From the moment you sit down, they immediately start you off with complimentary popcorn drizzled in bacon fat. It smells delicious and is terribly addictive. Salty and fatty indeed! You can go through three bags of them while sipping on some wine and chatting with friends without even realizing it. How can anything go wrong with bacon in it? But fear not, because not all of the items on the menu are as greasy and fatty as one might think. 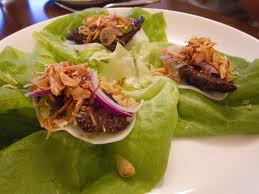 The Korean BBQ lettuce wraps is a great dish to start off with. For the sauce, they used pickled dikon and miso and it goes very well with the grilled steak. It's sweet, light and savory. 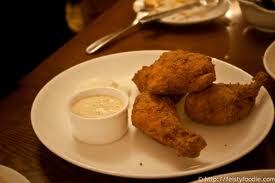 The fried chicken was really good too. It wasn't too greasy and the meat was tender and juicy. The other dish I got was the striped bass. I loved the plum sake soy sauce they used. Striped bass usually has a mild, sweet taste so the tangy, sweet plum sauce compliments the bass very well. 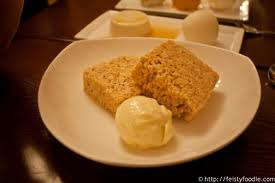 For dessert I ordered was the rice krispy and marshmallow ice cream. It certainly beings back memories of my childhood. Many dishes on the menu are served tapas style and meant to be shared. So if you go with a couple of friends, be prepared to order a lot of dishes because the portion is rather small. They update their menu every once in a while so they may not have the same dishes you ordered from before. I was looking forward to getting the crack and cheese, which is a spin on the traditional mac and cheese but it wasn't on the menu anymore. Their dishes are definitely not boring. The combination of the different ingredients they used is truly creative, exciting and fresh and the results are delightfully good. They are not afraid to take risks and it really pays off because it brings life to the traditional dishes we are used to having. The atmosphere was warm, cozy and inviting. Our server was attentive and really took the time to explain some of the dishes on the menu for us. One minor inconvenience is that they don't accept American Express. So remember to bring your Visa card, don't leave home without it. Parking is relatively easy to find. There is street parking on Queens boulevard and metered parking under the overpass on Queens boulevard. The 7 train can also take you there and you can get off at 40th street.